It’s a bird… It’s a plane… No, it’s teeny tiny popcorn (minus the corn). 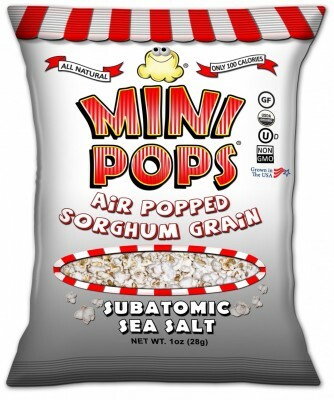 It’s Mini Pops popped sorghum! 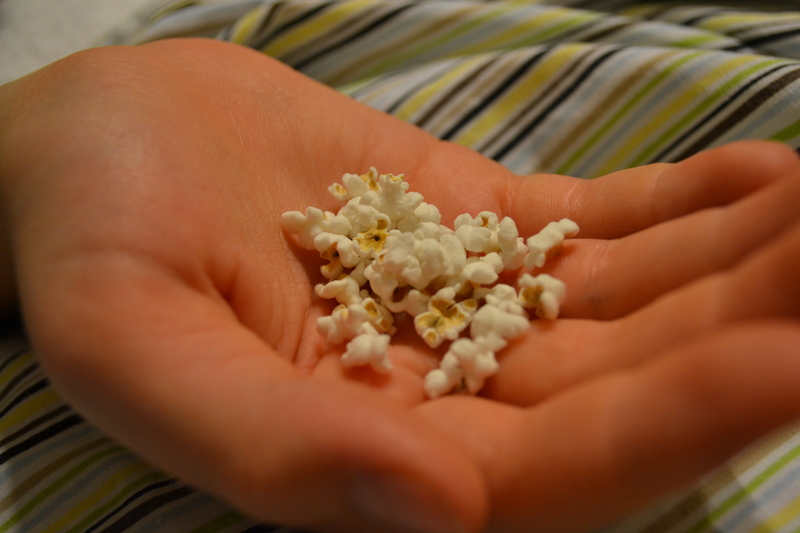 Except for it’s teeny tiny size, it really does look and taste like popcorn. That is actually Braden’s hand. He’s ten, and has hands the size of mine (actually, his are now a bit bigger; I have tiny hands). You can see just how small these little snacks are. It’s been awhile since Braden’s had popcorn, since he was diagnosed with an allergy to corn (among others) at the beginning of the summer. We’re so excited to find something like this! The people at Mini Pops sent us some samples awhile back, and we’ve been waiting for a good time to get together and do this review. Basically, if you like popcorn, you’ll probably like Mini Pops. There’s Subatomic Sea Salt, which is basically plain. The Itty Bitty Butter really does have just a tiny hint of butter flavoring. The Baby White Cheddar also has a faint, though more noticeable, flavor, though you do need to think about it more than you would with most cheddar-flavored snacks. It definitely is not going to leave a thick sticky powder on your fingers. Braden liked the cheddar the best, because it had the most flavor. The Hot n’ Chilly Chili is also a tame flavor, with only a hint of spice. Martin, who so dearly loves freakishly spicy things, thought they tasted like plain popcorn. Silly man. Mini Pops has some other flavors to try, too. The really nice thing about Mini Pops (besides the fact that Braden can eat them) is that there are no hulls. Nothing gets stuck in your gums! They also have fewer calories and more protein than popcorn. A 100-calorie serving (quite a bit of Mini Pops) has 3 grams of protein and 3 grams of dietary fiber. Not only that, but they are also certified gluten-free by the Gluten Free Certification Organization, so you know they are safe for a gluten-free diet. I think I’m going to have to make Braden some “caramel corn” with the Mini Pops and some sweetened condensed milk. So far, I’ve only found recipes that also call for corn syrup, but I think I might be able to try substituting some Hey Shuga! I’ve got a plan! This entry was posted in Braden-Friendly, Reviews and tagged Braden-friendly. Bookmark the permalink. Wow! Looks so Yummy! So excited to learn about this product – thanks for sharing! Mini Pops makes a Caramel flavor!! They are really good! I bet they are. They didn’t send us any of those because they contain soy and Braden is allergic. But if I find them when I’m out by myself, I’ll definitely have to give them a try.